1 or 2 halved baby carrots, for garnish (optional). Fill a cocktail Shaker with ice. Add all of the remaining Ingredients except the garnish and shake well. 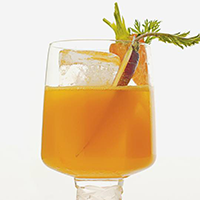 Strain the drink into an ice-filled Highball Glass and garnish with the halved baby carrots.